It is November and I am not quite ready to give into colder weather "looks". So I will ease myself into warmer cardigans with this light and breezy Escada red three quarter sleeve sweater. I keep things simple underneath with a button front white shirt and plain jeans. The focus is clearly on the sweater. And rolled up my sleeves a cuff to meet the sweater sleeve. 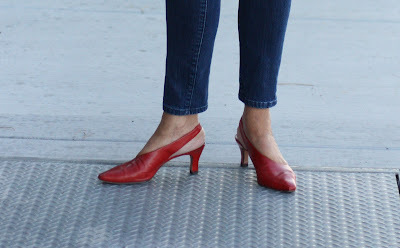 The red heels "elevate" the look and I'm ready for a Fall breeze and colored leaves. Remember: With the right pair of red shoes, a woman can do anything!